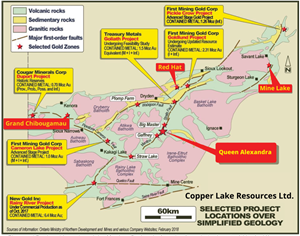 TORONTO, Dec. 13, 2018 (GLOBE NEWSWIRE) -- Copper Lake Resources (TSX-V: CPL) is pleased to announce the results of the recent field program on the previously producing Queen Alexandra Gold Property, located 47 km south of Dryden, Ontario. The 2018 program was designed to confirm the grades of vein material from the historically producing mine and to locate, sample and map extensions to the gold vein system to determine the overall grade and size potential. A total of 19 field samples were collected. The current program returned assays of up to 45.00 g/t Au and 17.50 g/t Au from quartz vein material collected from the Queen Alexandra Shaft. Sampling in 2014 from the waste dumps at the Queen Alexandra mine shaft returned assays of up to 28.80 g/t Au, 89.30 g/t Au, 140.80 g/t Au and 340.80 g/t Au. The recent field program located a new shaft 60 m SE of the Queen Alexandra Shaft and sampling of vein material from the shaft returned values of up to 1.50 g/t Au. 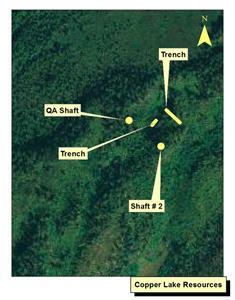 Field observations showed that both shafts are located along a predominant NE trending ridge that is approximately 100 m in length, with the Queen Alexandra shaft located near the bottom of the ridge while shaft #2 is located near the top of the ridge 60m to the SE of the main shaft indicating a width of the vein system of at least 60 m wide. The ridge is composed of altered mafic volcanic rock. The predominant gold bearing mineralization is comprised of smoky quartz within moderate carbonate and chlorite alteration. The next step will be to prospect further along strike to the NE and SW to establish the strike length and width of the well mineralized gold system and determine the overall size and grade potential located at the Queen Alexandra gold property. Rock samples are collected in plastic bags in the field and are shipped in secure sample bags using unique security coded tags to Activation Laboratories Ltd. in Dryden, Ontario, an accredited mineral analysis laboratory. Samples were prepared in Dryden and assays were performed in Thunder Bay by Activation Laboratories. All samples are analyzed for gold using fire assay with an AAS finish, and samples returning over 5.0 g/t Au are analyzed using fire assay with a gravimetric finish assay method. Located in the Lower Manitou Lake area, 47 km south of Dryden, Ontario, and 400 metres east of Carlton Lake, 130-hectare Queen Alexandra Property occurs within mafic volcanic rocks of the Blanchard Lake Group. Quartz veining in chlorite-carbonate alteration, averaging 0.5 m wide, has been located within a major NNE-SSW shear zone which was historically mined via the Queen Alexandra shaft, which was sunk 25 m in 1904. According to the historical records, this shaft was sunk to the depth of 25 m and reported grade of approximately 25.00 g/t Au. Work by the Ontario Geological Survey in 1989 and Bond Gold in 1990 returned impressive gold assays of up to 2.24 oz/t Au (OGS), but there was no recorded follow-up work done until 2014 when surface sampling was conducted and sampled around the shaft and nearby open cut 60 m to the southeast, which is now known to be a second shaft. The Queen Alexandra program was overseen and managed in the field by Nikolay Bashaev, P.Geo. The contents of this news release were read and approved by Gary O’Connor, FAusIMM, who is acting as QP for the Company under the rules of NI 43-101. The Norton Lake nickel, copper, cobalt, PGM property (69.79%), located in the southern Ring of Fire area, is approximately 100 km north of the Marshall Lake Property, and has a NI 43-101 compliant measured and indicated resource of 2.26 million tonnes @ 0.67% Ni, 0.61% Cu, 0.03% Co and 0.46 g/t Pd. Cautionary Note Regarding Forward-Looking Statements: This news release includes forward-looking statements that are subject to risks and uncertainties. Forward-looking statements involve known and unknown risks, uncertainties, and other factors that could cause the actual results of the Company to be materially different from the historical results or from any future results expressed or implied by such forward-looking statements. All statements contained in this news release, other than statements of historical fact, are to be considered forward-looking. Although Copper Lake believes the expectations expressed in such forward-looking statements are based on reasonable assumptions, such statements are not guarantees of future performance and actual results or developments may differ materially from those in the forward-looking statements.